If you are looking for one of the easiest ways to change how your smile looks, consider tooth bonding. 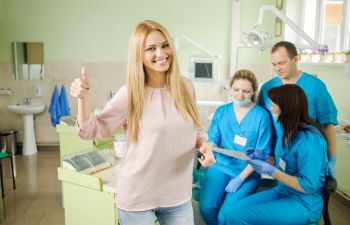 While tooth bonding cannot correct all smile imperfections, especially the ones that involve large gaps, extensive damage or crooked teeth, it can be an excellent remedy for a number of minor flaws. Best of all, dental bonding is a procedure that respects your time and your wallet. It is one of the most budget-friendly cosmetic procedures available and it can be done in the office within minutes. The procedure involves applying a tooth-colored resin material on the tooth, and then using a special light to harden it. This composite resin material bonds to the tooth to improve your smile to optimal function and natural looking aesthetics. Rest assured that dental bonding does not require extra maintenance and it can handle your normal day-to-day functions and cleaning. Don’t let the embarrassment of discolored, chipped or misshapen teeth keep you from showing off your smile. Schedule a consultation at Mitzi Morris, DMD to learn if cosmetic tooth bonding is right for you. If your smile imperfections require more than dental bonding, we offer a full menu of other cosmetic services at our Roswell office.